Volunteers – cheap labour or free spirits? My hope is to start a debate. This is just a short article, and I’m aware that I’m bringing up lots of issues without always developing them fully. Volunteering is important, and I don’t think its future should be in the hands of policy makers, or subject to a passive acceptance of changing agendas in the voluntary sector. • for the benefit of others/the environment. I think the definition only gives half the story. It’s the underlying spirit of volunteering that makes it so special. It’s hard to pin this down. I’d say that a key point is that volunteering is a relationship based on mutual trust. It’s not on a legal footing like employment. Volunteers don’t have to be there, and can leave at any point. On the other side they don’t have employment protections, just an expectation of reasonable treatment. I would include diversity and inclusiveness within this spirit. Volunteering should be open to all. There can be a greater flexibility than with paid work. We can change roles or hours to better suit individuals, providing extra training or support where needed and so on. We don’t look so much to qualifications and prior experience. For many organisations it’s their volunteers who give them their strongest links to the local community. Lastly, I’d add informality to this list. By and large, volunteers don’t want their work to feel like employment. This doesn’t mean that it shouldn’t be well-supported and well-organised – volunteers don’t want to see their time being wasted. In training I sometimes use the phrase ‘structured informality’ – from the volunteer’s point of view things should just seem to work well rather than seem bureaucratic on the one hand, or chaotic on the other. I believe that all these aspects of volunteering come under periodic attack – and that this is likely to increase as the voluntary sector increasingly becomes a surrogate private sector, bidding for contracts rather than identifying needs and seeking to provide help on their own terms. Paid volunteering? The idea of paying volunteers in some way has often been voiced, particularly to encourage volunteering by younger people. This could be in cash or other tangible benefits such as vouchers or reduced council tax. One current example is the ‘Orange Rock Corps’ scheme, which rewards young people who volunteer for four hours with a free gig ticket. This might not sound so terrible, but I worry that we are monetising the idea of lending a hand. Have our values become so distorted by the market that we have to be paid to support our communities? There is also a danger of creating a two tier sector. Why volunteer for the small local activist group when you could get Debenhams vouchers from the household name charity down the road? There can be legal problems here. Inducements to volunteer may lead to the unwitting creation of a contract with volunteers, giving them employment rights – potentially even the minimum wage. No doubt this issue could be solved by legislation, but doing so may create a category of low paid workers without employment protections. The problem is that payment changes the fundamental nature of volunteering. For many people – including those receiving support from volunteers – it is the fact that the work is not being done for financial reward that makes it special. If we do start incentivising volunteering, when does it simply become cheap labour? It’s not even clear that it would work. When the Russell Commission into youth volunteering asked young people what would attract them into giving up their time, payments came very low on the list of responses. Compulsory volunteering? Compulsion would seem to be completely alien to volunteering – after all, dictionary definitions of ‘voluntary’ hinge on free choice and a lack of coercion. However sometimes volunteering is held up as being so beneficial that people should be made to do it. Where the mantra used to be for a return to national service to sort out young people, now there are periodic calls for mandatory ‘citizen’s service’. Unemployed people get pushed into unpaid work, whether in the voluntary or private sector. This is not the place to go into the morality of such schemes, but whatever your views on them it should be important to distinguish them from volunteering. If not, we run the risk of equating voluntary work with punishment or widely reviled government schemes such as Workfare. Internships? There has been a backlash against unpaid internships in the media, and from interns themselves. Groups such as Intern Aware see the practice as little more than cheap labour. It’s often argued that in return the intern is getting a great leg up into a potential career, but this leads into one of my major objections – that such routes are only open to those who have the financial support to allow them to survive several months without pay or benefits. People who would strongly object to discrimination in the sector on the grounds of ethnicity, gender or sexuality seem to have no problem with opportunities being closed off on the grounds of class and income. What should we expect people to do without pay? 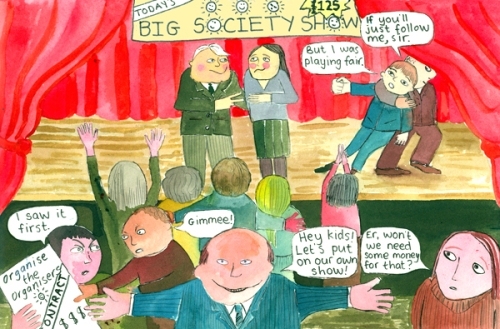 What the Big Society was actually about was never clear. There were some nice words about volunteerism, but the main proposal from this strandseemed to be that if public services were cut volunteers could step into the breach. The practicality of this was perhaps called into question when the unpaid Big Society Tsar Nat Wei reduced his hours, reportedly citing the need to make a living. When the spin is removed this idea simply means that paid workers would be losing their jobs to be replaced by unpaid workers. • What will these people be doing? • Who will be supporting and supervising them? • What resources are available to do this? Even without the Big Society rhetoric, cuts place increasing pressure on volunteering. Organisations are shedding paid workers and wondering whether they can fill the gaps with volunteers. At the same time the move to a commissioning culture threatens to turn volunteers into a means to an end – resources utilised to fulfil contracts. Volunteering is in danger of becoming more about delivery of outsourced services than mutual aid and community support. There is an intrinsic threat to diversity here. In a target-led environment with staffing levels at full stretch, why spend more time training the volunteer who has been out of work for four years? Why devote extra time to supporting the person with a lack of confidence? This also puts more pressure on organisations to adopt a ‘workplace model’, over-formalising volunteering – the very thing that puts many people off from giving their time. Volunteer managers can try to offset the risks, but are often fighting a losing battle in their organisations – sometimes with their line managers – over an understanding of how to treat volunteers. Volunteering is often located within HR, which isn’t the natural fit it seems – again, the volunteering relationship is qualitatively different to the employment relationship, and a Head of HR is less likely to understand this. • When does volunteering become exploitation – when should we be paying people to carry out particular roles? • When does volunteering displace paid workers and become a threat to jobs? There are not easy answers here – small underfunded organisations could not exist without volunteers carrying out roles that might be paid elsewhere, and organisations could have the dilemma of using volunteers to replace paid staff or see vulnerable service-users lose vital support. But we should still be asking the questions. There is an attitude that volunteers can and should be doing anything. I once heard a chief executive express this opinion at a conference. I didn’t get the chance to ask if, in that spirit, she’d now forgo her wage and continue her role as a volunteer. Support for volunteering is under threat. There is a volunteering infrastructure in place, a network of Volunteer Centres who support volunteering in their area and act as brokers, matching volunteers and organisations. They have traditionally been overlooked, even when government has trumpeted the need to get more people volunteering. More recently many of them have been facing cuts, losing staff and their capacity to work with local groups. Their funding largely comes from local authorities, for whom external funding is becoming a luxury. Even the national support agency Volunteering England has been savagely cut to the point that it could no longer exist as an independent body, merging with the National Council for Voluntary Organisations. Ironically their funding was slashed at the height of the Big Society rhetoric. These bodies are not just faceless bureaucracies. For all their faults – and with Volunteer Centres most of these have always been due to a lack of resources – they offer valuable guidance and help to volunteer-involving organisations. Losing this means, in the long run, a worse experience for volunteers. Why care? Some people feel we shouldn’t take an ethical stance on volunteering. Hey, if it ‘works’, what’s the problem? For me, the problem is that we lose what is special and unique about volunteering. The fact that people don’t have to be there, either for financial reward or compliance with government schemes is in itself what really distinguishes volunteering from paid work. Changing this will turn volunteering into a mere subset of employment. If volunteering is as important as ministers and voluntary sector CEOs like to say it is, surely it’s worth defending? This entry was posted in evidence and views from elsewhere, Stories and tagged community, managerialism, volunteering by NCIA admin. Bookmark the permalink.